For this recipe one bunch of beets, with greens, serves 2 to 4 people as a side salad or 2 as a more substantial part of a meal. Scrub the beets and wash the greens. Cut the greens from the beets and set aside. Cut the beets into wedges and toss in 1 tablespoon of oil. 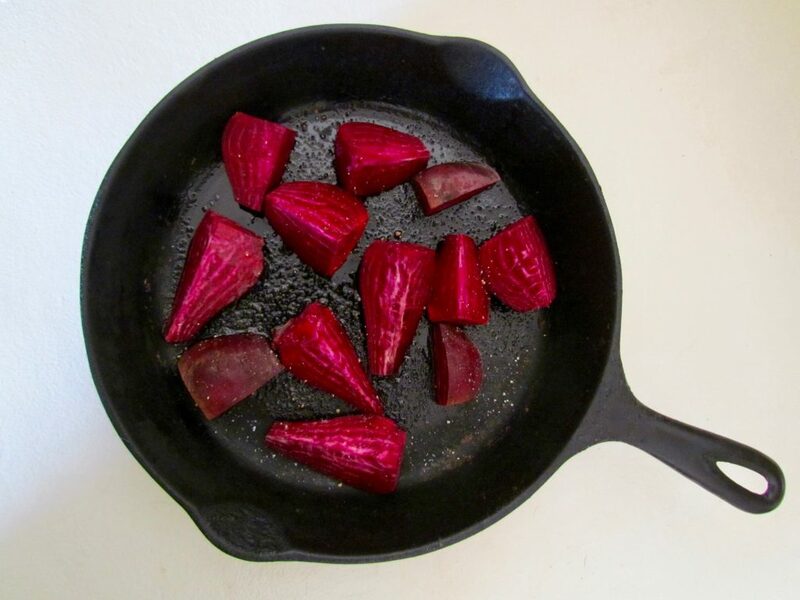 Lay the beets out in a single layer on a baking sheet or oven-safe skillet and sprinkle with a bit of salt and pepper. Bake, covered, until fork-tender (about 35 to 45 minutes, depending upon the size of your beet wedges). Remove the cover and bake for 10 minutes more. When nicely browned, remove from the oven and set aside. While the beets are baking, wash your greens and remove the stems. Chop the greens roughly and set aside to drain. 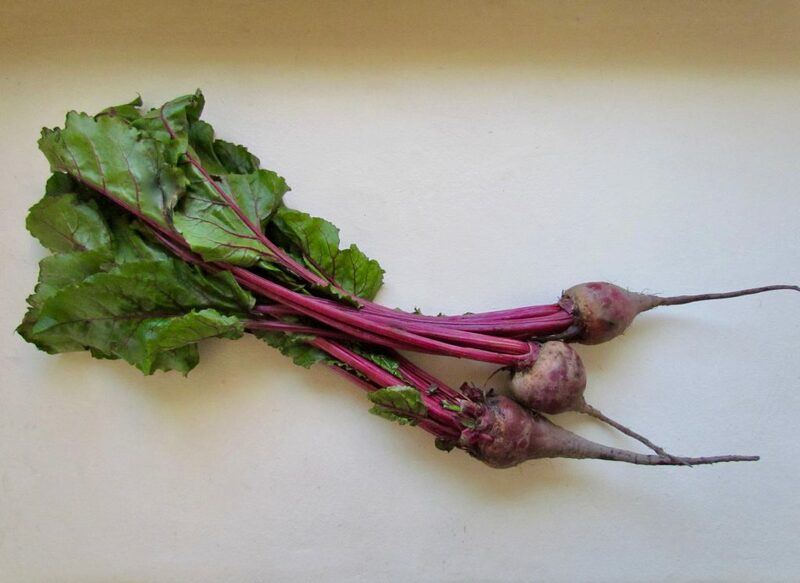 Farmers’ market beets come in different colors such as jewel red, golden, and even striped! Pour 3/4 cup of oil in a skillet and sauté the garlic on medium low heat (don’t let the heat get too high, you don’t want to burn the garlic). Cut the stems off your chiles, slice them open, and remove the seeds. Add them to the hot oil along with the garlic. Sauté the chiles for about a minute or two with the garlic. To the skillet from which you just removed your oil, chiles, and garlic, add the washed, chopped beet greens. Add 1/4 to 1/2 cup water and cover, steaming the greens over medium heat until cooked and wilted. Remove the cover and continue cooking until most of the liquid has evaporated. 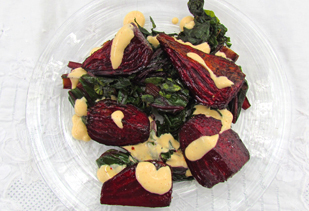 To serve, lay the cooked beet greens on your plates, top with baked beets, and drizzle the dressing over the top. 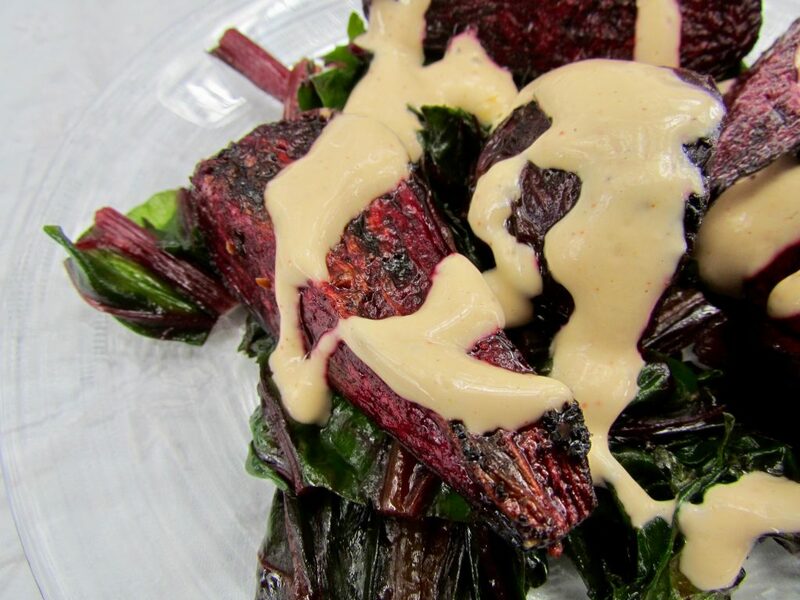 Then, enjoy the delicious marriage of sweet beets, cooked greens, and a creamy red chile dressing! This recipe can be served in larger portions alongside rice, or as an accompaniment to roast chicken or pork.